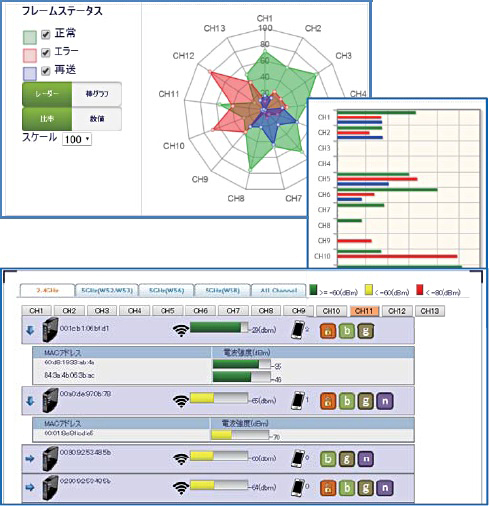 NX-1 is a high performance dual band wireless LAN network analyzer for SMB and Enterprise environments with 802.11a/b/g/n support. NX-1 provides an easy to understand simple menu that can be used even by those who are not familiar with specialized wireless LAN knowledge. Spectrum Analyzer -- Plot the received RF characteristics on a visual graph. WLAN Network Observation -- Measure RF Environment for a specified period of time. Frame Capture (WLAN Protocol Sniffer) -- Capture WLAN frames in a specified WLAN channel and view them in Wireshark. 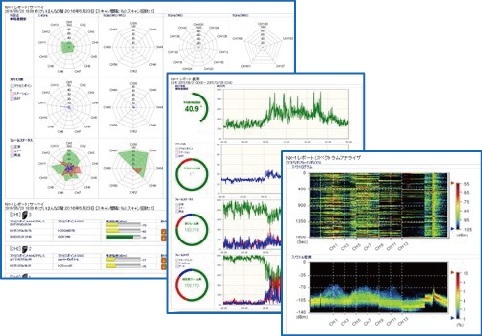 The NX-1 collects radio wave characteristic data for Wireless LAN as well as non-WLAN transmissions. This data is then presented in an easy to understand visual form. The visual information and all the data output can be easily printed. 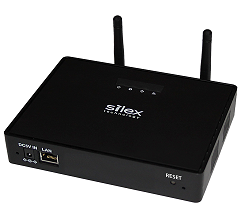 It can be easily monitored and operated remotely over the network. Packet Acquisition/Survey can be performed to troubleshoot the network using Number of Terminals (APs/STAs), Transfer Rate, Retransmission Count, Packet Loss Rate, Channel Utilization, and AP Information (SSID, BSSID, Wireless Standards, Security Settings, Channel Widths). Data Analysis Functions and Visualization to Web Page allow any User to Intuitively Grasp their WLAN Network Characteristics. WLAN Environment Survey -- Effective in channel design and when installing access points (APs) in a netowrk. Sequentially scan the specified channel, measure the radio wave state in the vicinity of the wireless LAN. The measurement results are displayed in a graph with a simple analysis function. Spectrum Analyzer -- Analyze 2.4GHz and 5GHz bands. 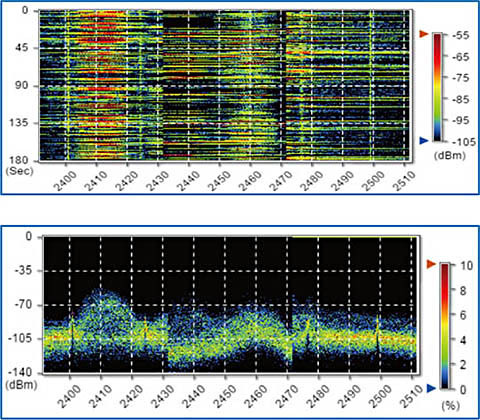 Analyze and Visually Plot the received radio wave components. Supports interference avoidance functionality which may be caused by WiFi equipment as well as interference by non-WLAN equipment. Data is collected and stored to an attached USB storage device. 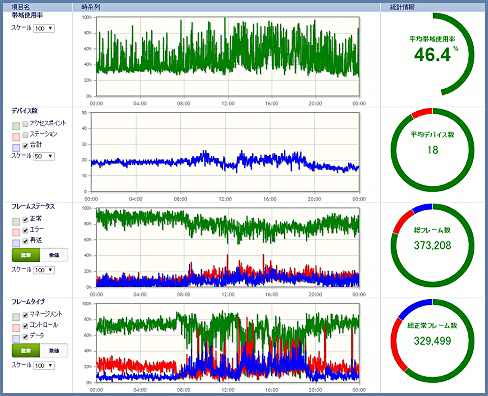 WLAN performance and fluctuations over time can be graphically/visually plotted and observed. Useful in research and investigation of problems in the WLAN environment before installing your WLAN equipment. 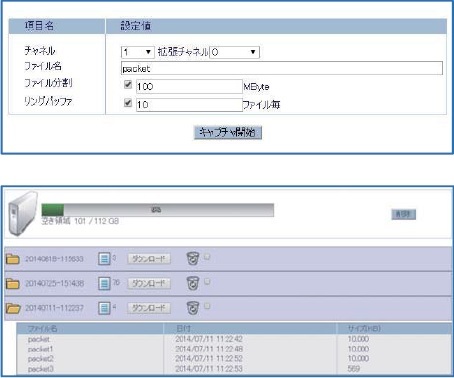 Captured data can be Analyzed using Wireshark.